On the right side of the photo is highway 200, which goes from Puerto Vallarta South toward La Manzanilla, Melaque, Barra de Navidad, Cihuatlan and eventually to Manzanillo. 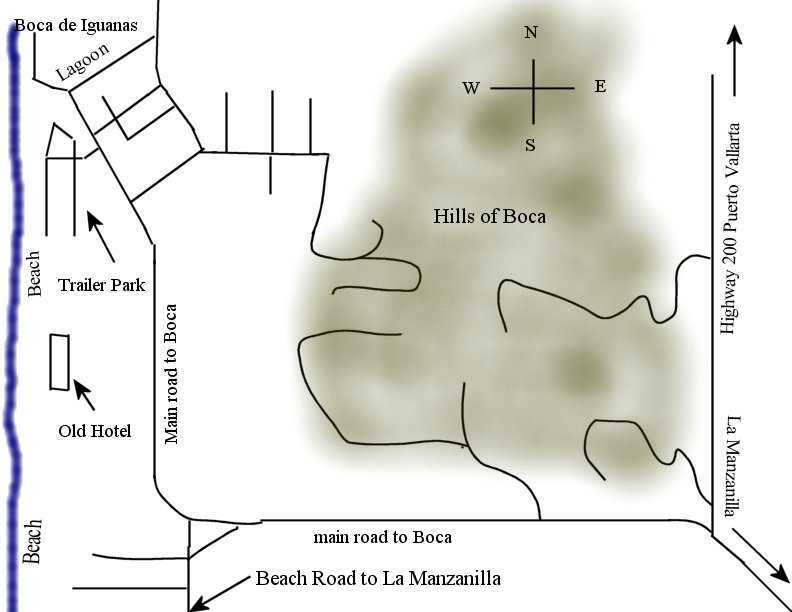 Spurring off of that you have (top to bottom) two dirt roads which lead to ocean view homes on the hill tops and then the main road to Boca de Iguanas. Taking the main road to Boca (watch out for the huge speed bumps) spurring off of to the right is another dirt road, which leads to hill top ocean view homes. As you head toward the ocean (left side of the photo) the main road curves right. Off to the left is a dirt road, which goes along the beach to La Manzanilla. Following the main road you will see an old hotel on your left and the ocean view homes up on the hills to the right and more huge topes. Next a couple of streets will appear on the right and a short distance later is the end of the road and the beach of Boca de Iguanas. The Procede map is of the street just to the right of the trailer park. It is the official map which shows properties ready to go to title. The contents of this site are copyright c 2006, Daniel Hallas. All Rights Reserved.